We had three more great trips to help us celebrate Memorial Day! 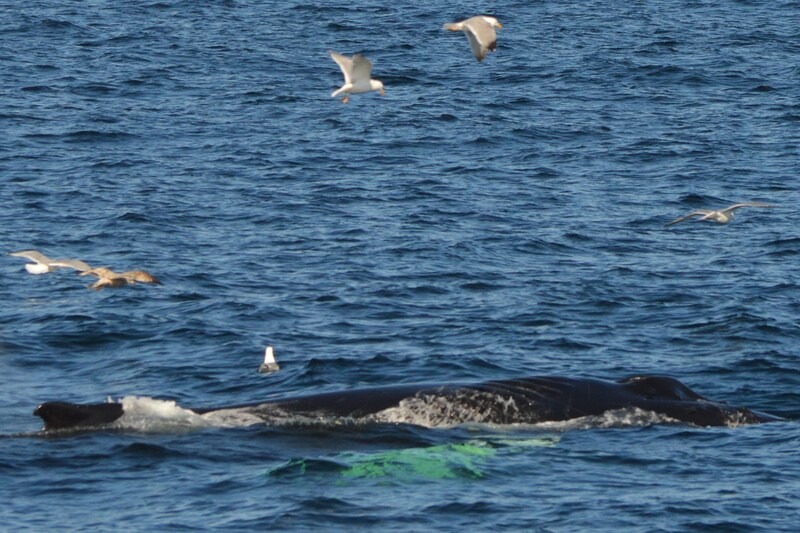 Each day we were able to see about 15 or more whales- humpbacks, minkes, and fin whales! 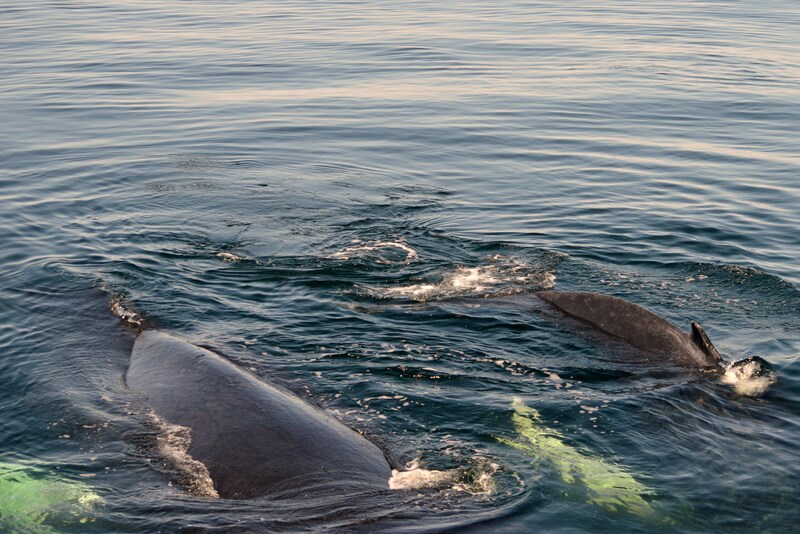 We had some great, close looks at two different mom and calf pairs on Saturday and Monday. Glostick’s calf surfaced so close to the boat that even with my camera zoomed out I could only get a small portion of the whale! 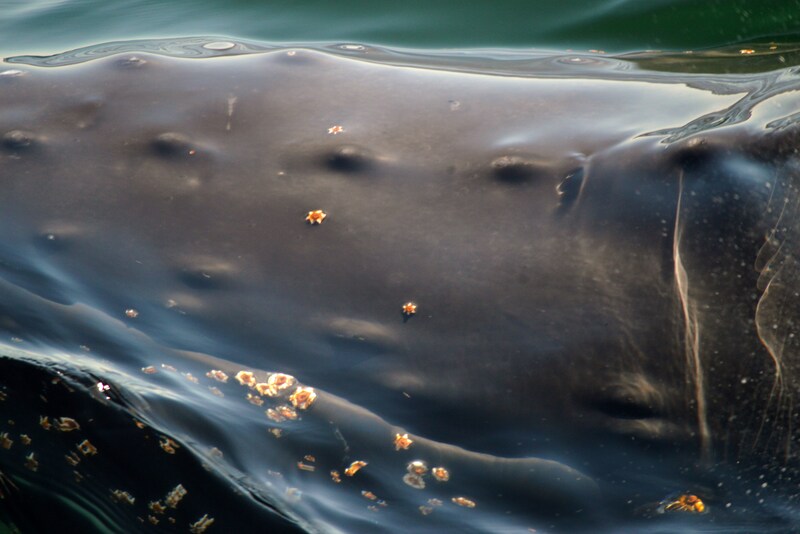 What is neat about this photo is you can see the whale’s eye, as well as a number of barnacles that have already attached themselves. 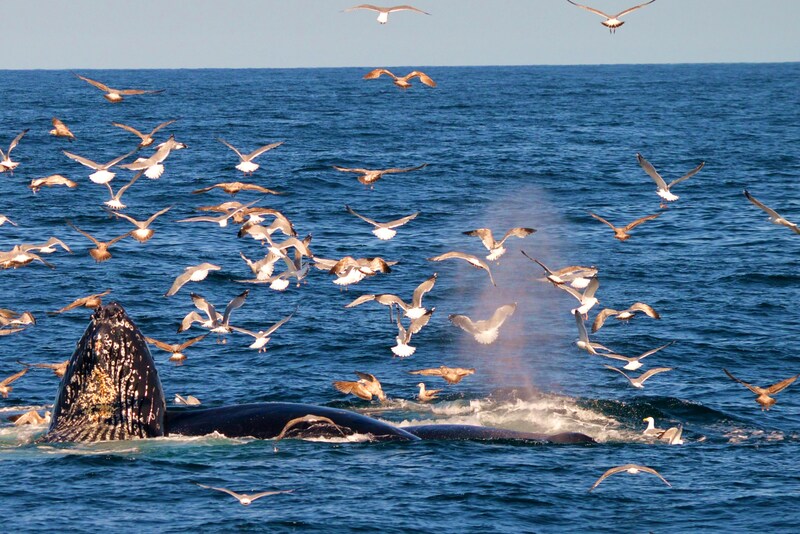 Humpbacks have been found to have up to 2,000 lbs of barnacles on their bodies! 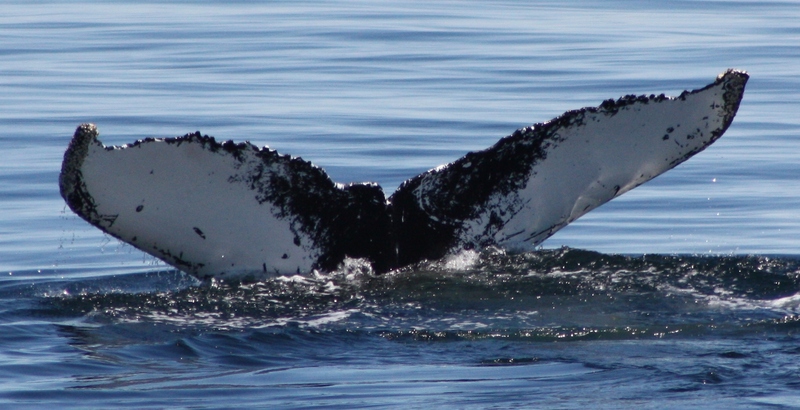 A very close up look at a young humpback calf! 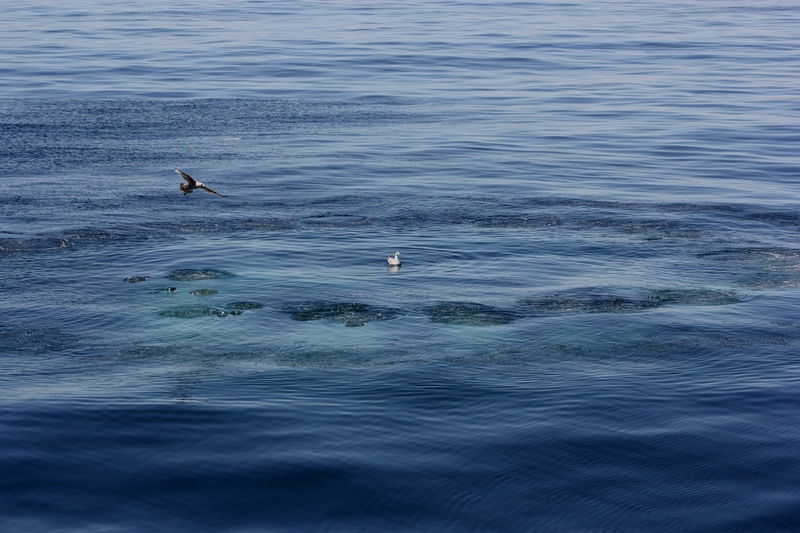 In addition to close encounters, there was also a number of surface behaviors. 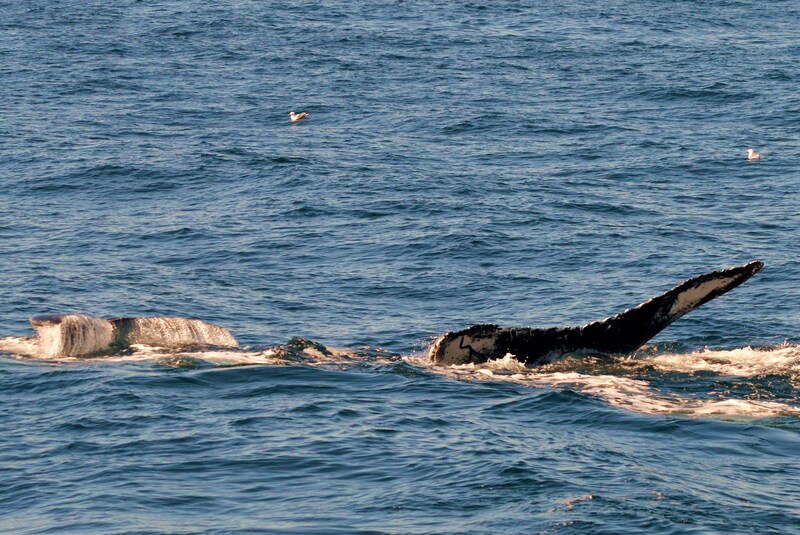 On Sunday we witnessed a couple of tail breaches. 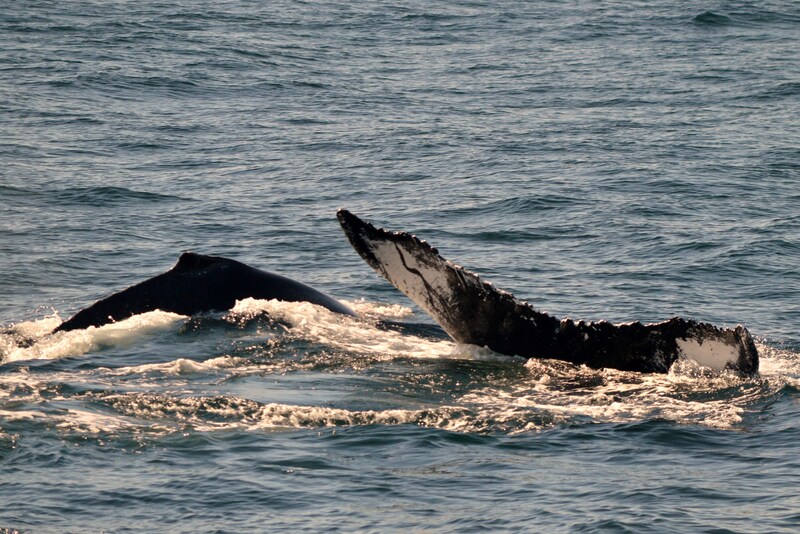 And a highlight- many of the passengers were watching a whale off the right side of the boat at one whale when another breached clear out of the water in the distance! 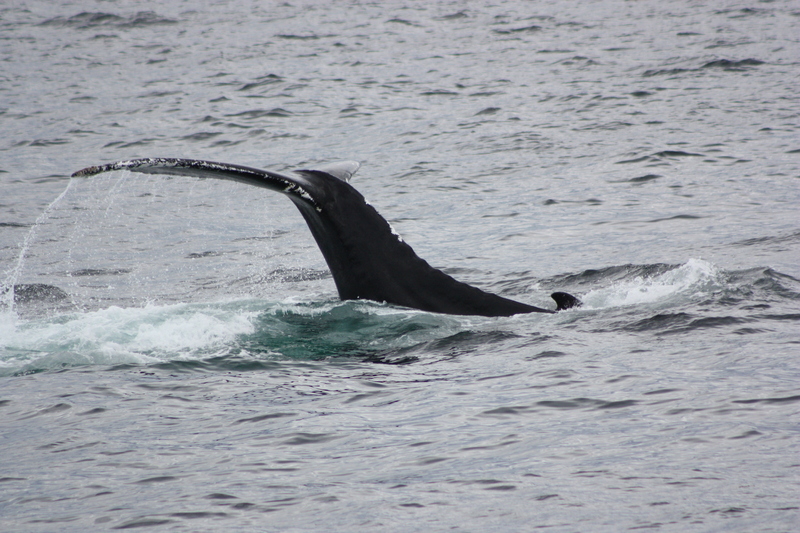 We were treated to one more full breach before making our way over as the whale (Rocker) did a series of lob tails. Also on Sunday, we got to meet Nile’s new calf! 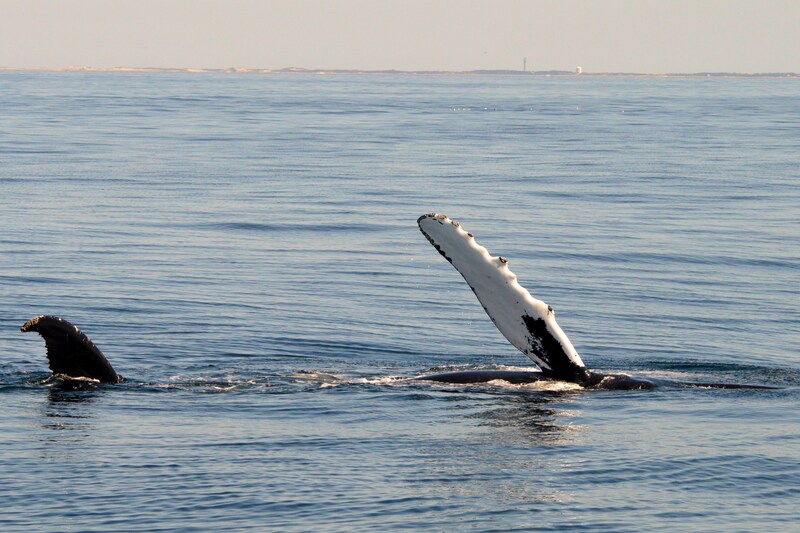 If you came on a whale watch last season, you likely remember Nile- who was by far the most sighted humpback of 2013. 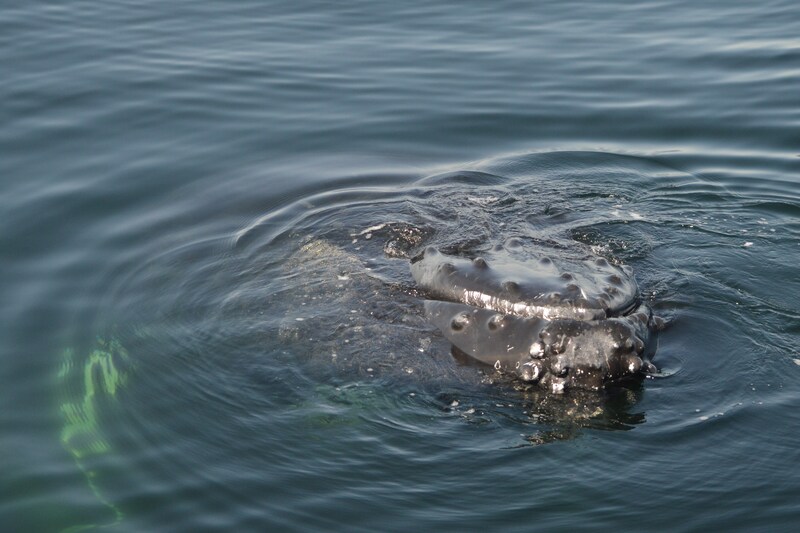 We had suspicions that she was pregnant, and when we had heard she returned to the Gulf of Maine with a calf, we couldn’t wait to see her. 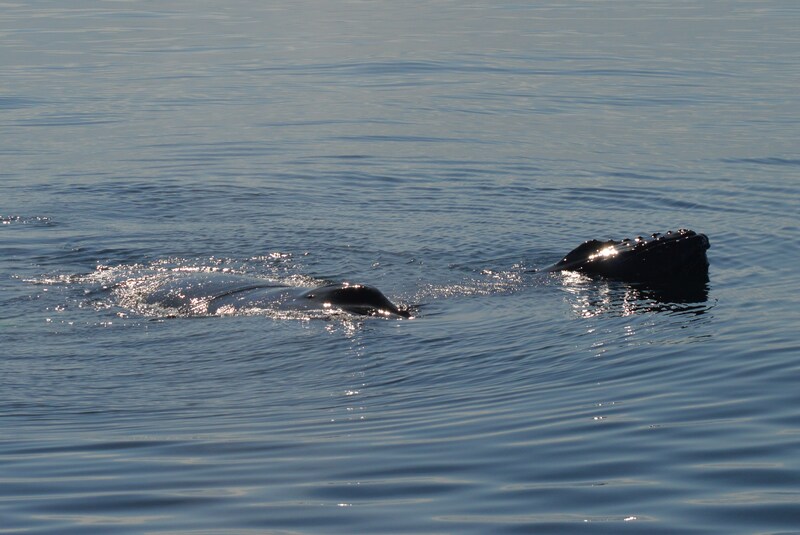 The distinctive mark on the left side of Nile’s fluke, with her calf alongside. 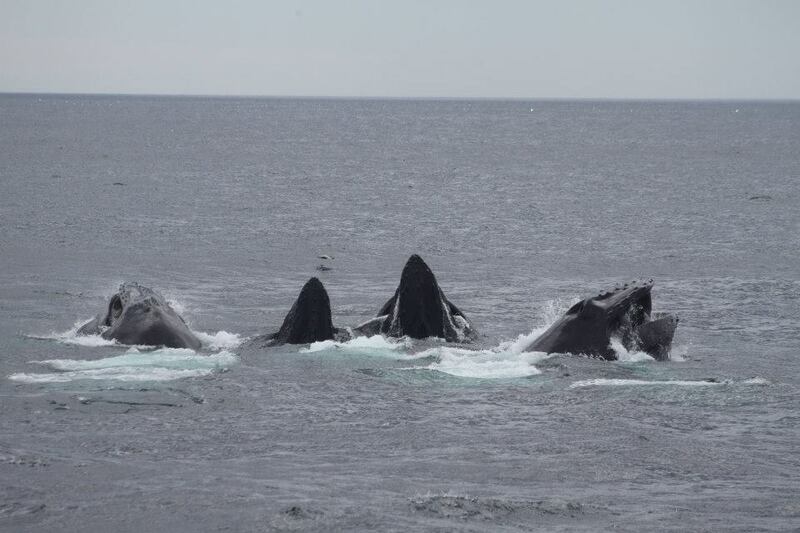 We were treated to a quick view of the calf’s fluke alongside Mom! 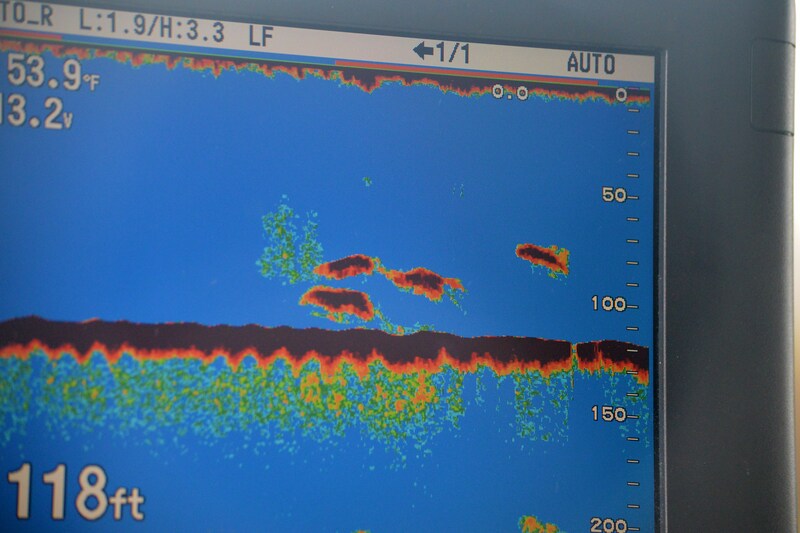 By now, you might have heard of the large amount of feeding that has been happening on Stellwagen Bank in the last few weeks. We had some great viewing of both closed and open mouth feeding- such an exciting thing to watch. We have really been enjoying our trips the last few weeks. A handful of the individuals we have spent time with include Geometry, Aswan, Milkweed and calf, Cajun, Jabiru, Measles, Yoo Hoo, and Glostick and calf. Let’s hope the whales stick around all season! What an amazing day today! It was flat calm and sunny and warm! 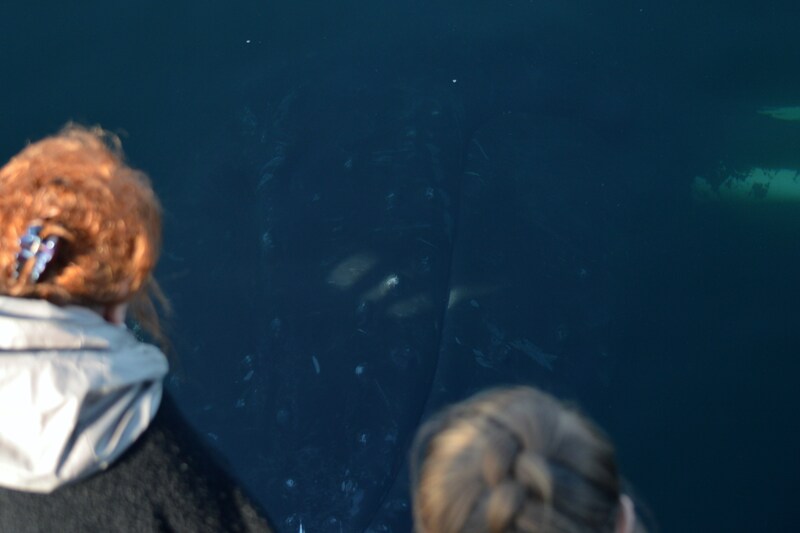 We started our trip with great looks at a basking shark. 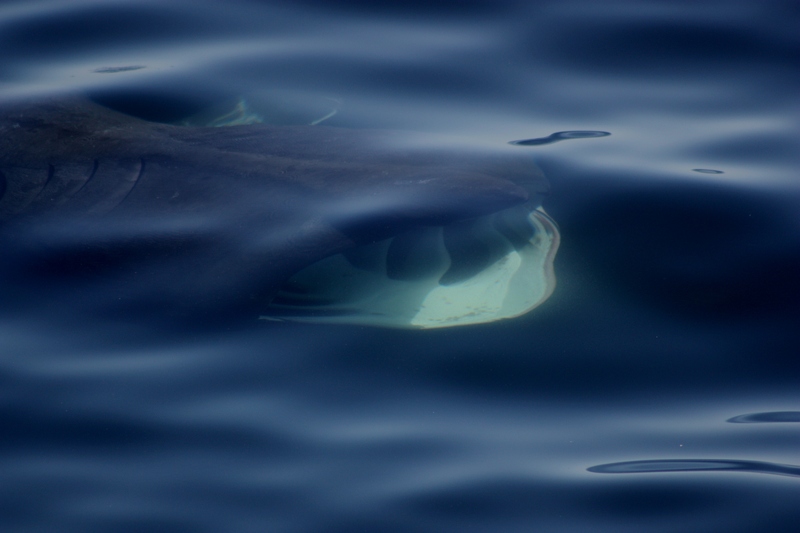 Basking sharks can be up to 25 feet long, and they have large gills that go from the top of their head to the bottom of their head. 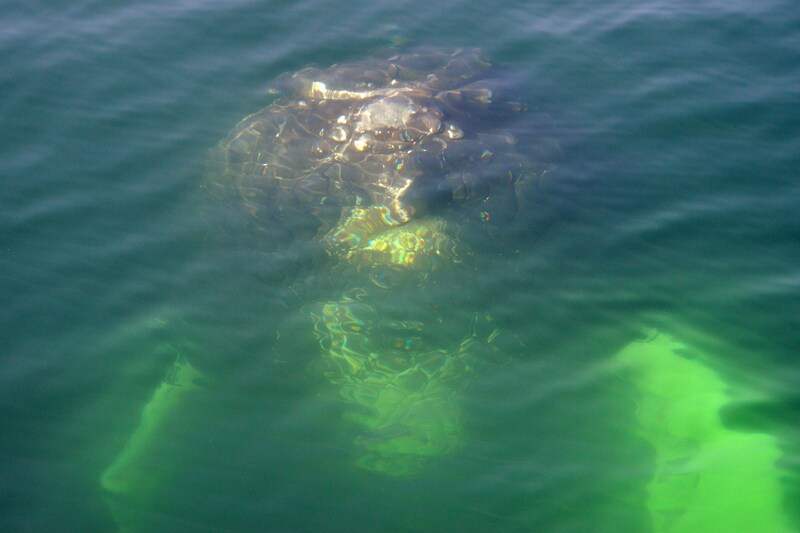 Basking sharks are filter feeders, so they use their gill rakes to filter plankton out of the water. I saw something today that I hadn’t seen in 20 years. 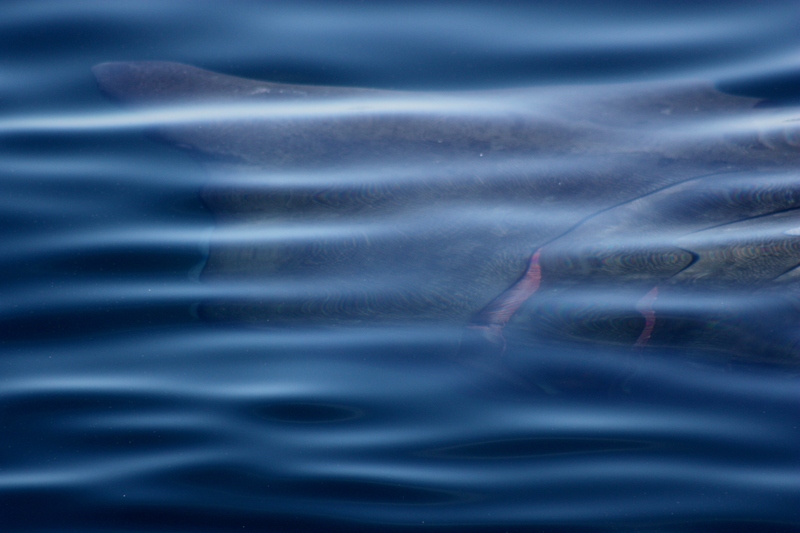 While the shark was feeding, you could see the gill filaments between the gills–they were bright red. Gill filaments are the soft, red, fleshy part of the gills.. As sharks swim, water passes through the gills and oxygen is taken into the blood by these filaments. This picture is enhanced a little so that you can see the red filaments! Rocker was first sighted in 1990. 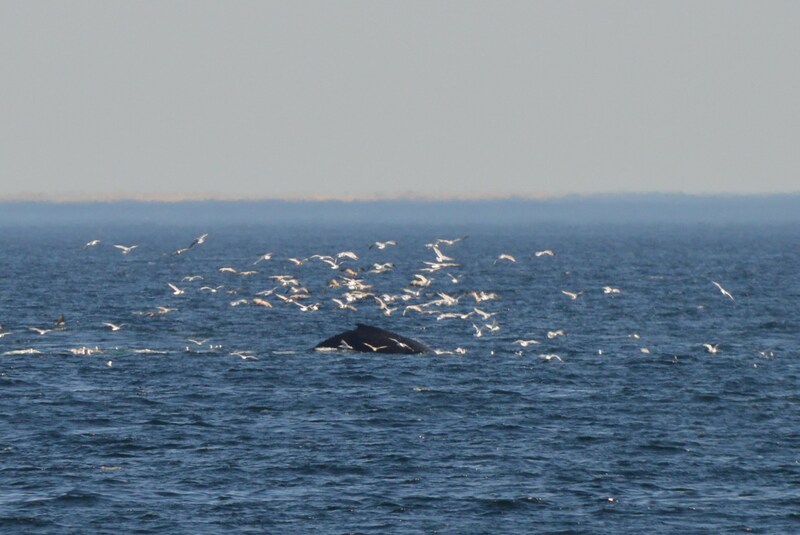 While with Rocker, another whale came over that fed using bubble nets! 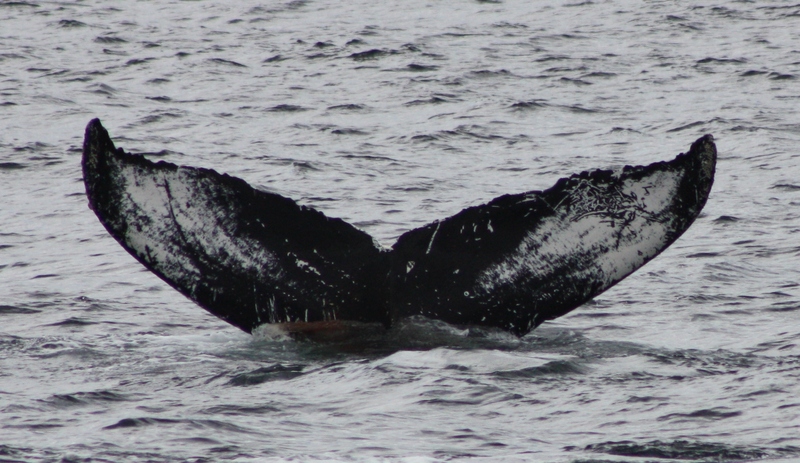 We saw at least 4 complete bubble nets during our time watching this whale. 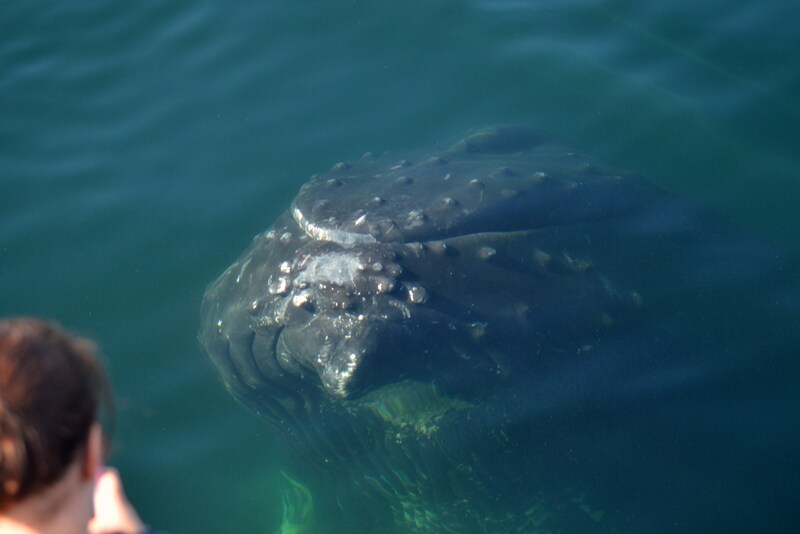 At one point, a very small calf popped up next to us (not near the mom) which was a big surprise. We saw very little of the calf, but watched the mom feed many times. We finally figured out the mom was Osprey, and we think this is her first calf. Osprey was first seen in 2007. 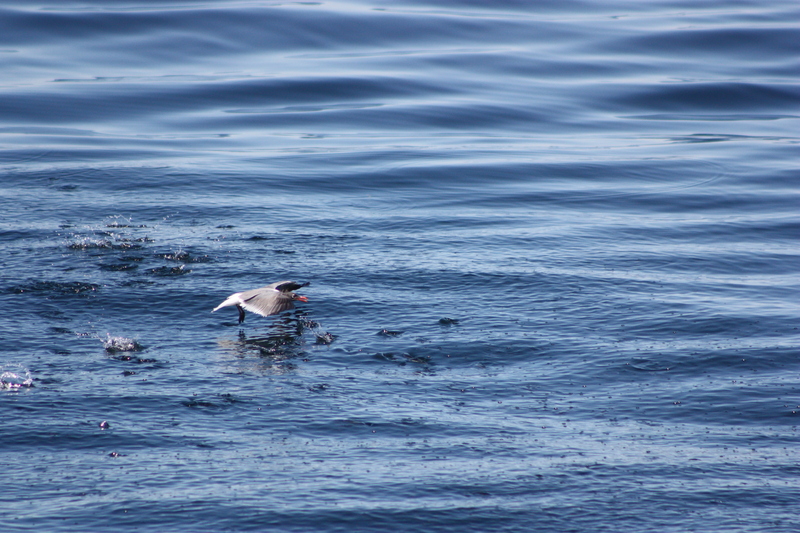 The sand eels were jumping out of the water as the laughing gull flew over!